DeLuxe Mirror with built-in special construction IP44 LED light clock and defogging. DELUXE Mirror – Austere Design. DeLuxe LED Mirror for bathroom is made of quality materials, special glass and European mirror sheet. This model features an IP44 LED light clock with blue lighting placed in the central part of the mirror, heating (anti-fogging), as well as a stylish horizontal stripe in the upper part of the mirror. 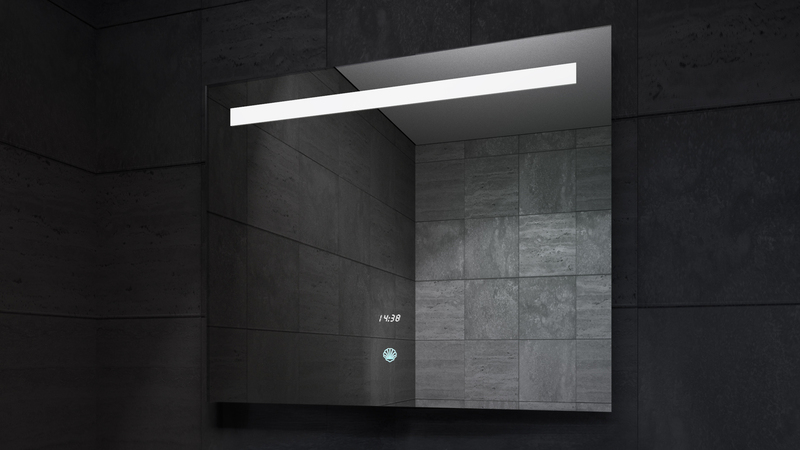 Upon switching on this mirror, a touch of hand on the turquoise logo turns on the hidden lighting (stipe) and actuates the heating (defogging). The LED light clock is always illuminated. This setting is exclusive in the market. DeLuxe LED is an above medium production complexity mirror. The standard components include: the imported 5mm thick mirror sheet, the hand touch sensor switch, the IP44 LED light clock, and the heating (anti-fogging).